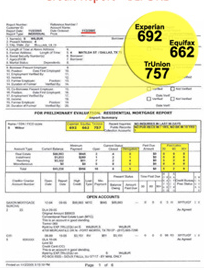 Home » Have You Requested Your Free Credit Report? The Fair and Accurate Credit Transactions Act (FACT Act) of 2003 allows everyone to receive one free credit report from each of the three main credit-reporting agencies once a year. AnnualCreditReport.com is the ONLY official site that truly gives you your credit report for free. Don’t be fooled by other sites that promise a free credit report, but make you buy something else to get it. The Federal Trade Commission has received complaints from consumers who thought they were ordering their free annual credit report at other sites, but couldn’t get it without paying fees or buying other services. AnnualCreditReport.com will try to sell you other services (like your credit score), but you do NOT have to buy or pay anything to get your free reports. How Many Reports Can I Get? You are eligible to receive one report from each of the three agencies once per year. You can request all three reports at once or you can spread out the requests so that you receive one report from an agency every few months. If you are denied credit, you can get an additional copy of the report, but only from the agency that the lender used to get your credit information. How do I request a Fraud Alert? AnnualCreditReport.com also offers advice about how to avoid and protect yourself against proxy websites, which can be used to trick you into giving out your private information. The site suggests that you type AnnualCreditReport.com directly into your web browser rather than using a link to request your reports.